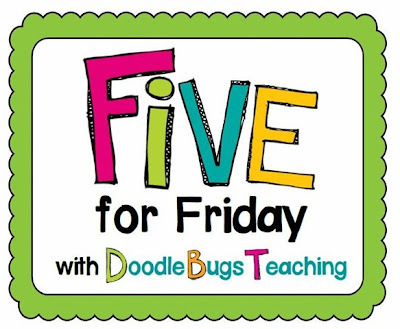 Teach Laugh Plan: Five for Friday on a Saturday! It is Saturday afternoon and I am just now able to sit and link up Five for Friday...... this explains a lot about my week, heck it explains a lot about my life!!!! LOL! 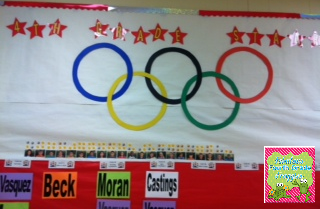 This week we started our 4th Grade STAAR Olympics. The fourth grade team came up with this fun STAAR review last year and made it even better this year! We still have some things to tweak out for next year but the students love it! Above you see a picture of part of our huge display. We have 20 events to complete in 10 days. Each day we have one Reading event and one Math event. The teachers created a review for each topic and a ten question quiz. The reviews we made were mostly flipcharts (ActivInspire) or Powerpoints and the quizzes were mostly paper and pencil quizzes. The topics we covered were our some of the standards the students will be tested on like main idea, inferring, fractions & decimals, etc. Students can earn gold, silver or bronze medals (made from paper and put on the display) and then the classes with the highest percents correct can win 1st, 2nd, and 3rd place. How cute am I in cartoon form? The fabulous Crystal Fox from the blog, The Library Fox made a mini me! 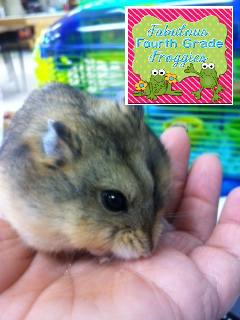 This week I discovered Lola, our class dwarf hamster, LOVES pretzels! I am not sure pretzels are good for her to eat but she ate it in seconds!!!!!!!!! I ended the week by paying off a bet! Yup, I lost and had to go to school dressed like a clown. The bet was that if this particular student made all A's on his most recent report card I would dress up like a clown for the day. He WAS a B but I knew he had the potential to make A's so for motivation we made that deal and he followed through on his part so I had to do the same. Anything for my student's success! Watch for a new post (about mid week) about a fun activity we recently did! Have a great weekend my froggy friends. 1. Your garden is looking great! 2. You are now my most favorite fabulously froggy cartoon! 3. Lola loves you just a little more for that pretzel! And 4. I WANT TO MAKE A BET WITH YOU!!! How fun would that be!?!! Oh my Squirrely friend, I sooooooo wish we taught together! We would have so much fun! Oh my goodness this is the best post ever! Growing tomatoes is awesome, that hamster is the cutest thing EVER, the cartoon is adorable! 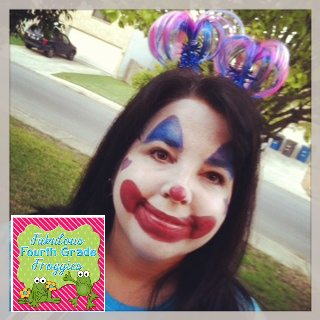 I want one AND you dressing as a clown = teacher of the year material!! Yep, your mini-me is very cute. I may have to break down and get one, too! Thanks! Yes Sheri, you need to get a mini-me! Yours would be soooo adorable! Okay, the cartoon of you is the cutest thing I have ever seen! I must hop right over to her blog and order one of myself! 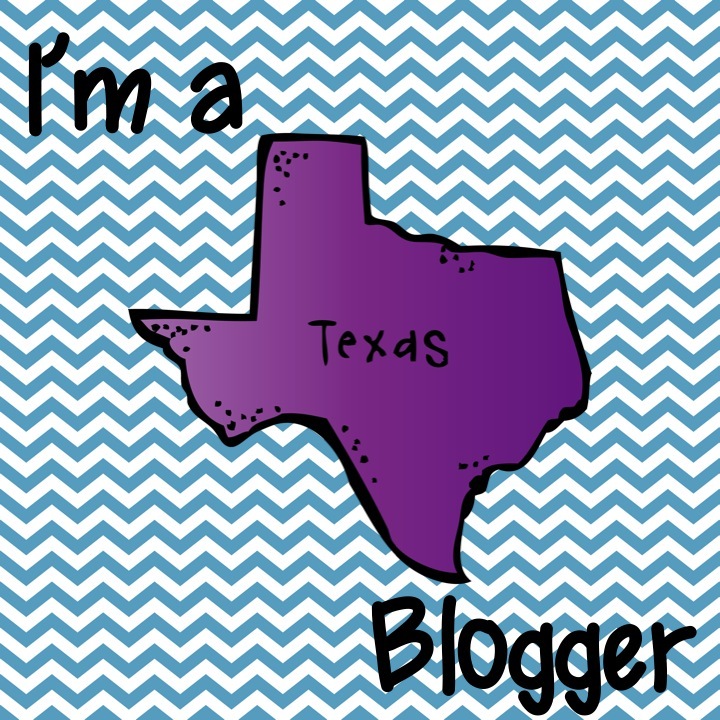 I wonder if mine will end up as cute as yours... Love your blog. I'm new to blogging but I am following you now! ;) Thanks for sharing! 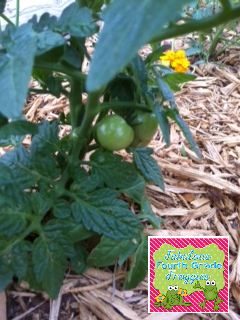 Your tomato garden is just BEAUTIFUL! I have one at home and although its tomatoes are juicy and delicious, the plant has suffered a bit through some odd weather we've been having lately. One day its 80-90 degrees and hot and humid and the next 40-50 degrees and windy. Needless to say the leaves aren't as green as yours! Loved that you followed through with dressing up as a clown... it's amazing what we do for our students.